The content of this article provides interesting history, facts and information about Charon. Charon was part of the family of primordial deities meaning the first or prime order of Greek and Roman gods. These Primordial gods pre-dated the famous Olympian gods of Roman mythology. The Primordial gods pre-dated the famous Olympian gods of Roman mythology. These ancient gods were the Titans. The Titans were the children of Earth and Heaven who sprang from Chaos, the mother of the Titans. The Titans consisted of six sons and six daughters, the one-hundred-armed giants (Hecatonchires) and the one-eyed giants, the Cyclopes. According to Roman Mythology the Twelve Olympian gods gained their supremacy in the world of gods after Jupiter led his siblings to victory in war with the Titans. Charon served as a ferryman to the Titans delivering the souls of mortals to the underworld. He continued this role for the Olympian gods with Pluto as the god of the underworld. The role of Charon the ferryman was to ferry the dead across the river Styx to the entrance of the underworld which was called Hades. Charon expected to be paid for his work and a coin was therefore placed on or in the mouth of the dead person. Failure to pay the ferryman meant the soul had to wander the shores for a period of one hundred years. He is often depicted with a double headed hammer. The role and persona of Charon was mimicked at various ceremonies involving the dead - specifically at funerals and at gladiatorial games. At the funeral ceremonies slaves, or servants, attended the funeral dressed as Charon. This symbolism was later transferred to the Roman Colosseum and other arenas when dead gladiators were escorted by a figure depicting Charon from the arena. The 'Charon' of the arena also had another duty. 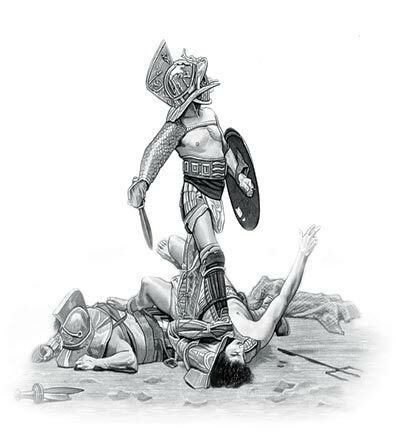 Badly wounded , but still living gladiators (these were the noxii, who had been sentenced to death in the arena who were not treated with honor), would receive a fatal blow to the head with a massive double headed hammer inflicted by a man dressed like the Ferryman of the Underworld. The content of this Charon category on life in Ancient Rome provides free educational details, facts and information for reference and research for schools, colleges and homework. Refer to the Colosseum Sitemap for a comprehensive search on interesting different categories containing the history, facts and information about Ancient Rome.